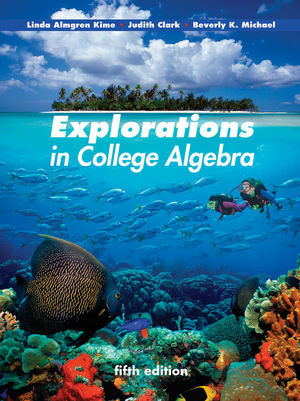 Explorations in College Algebra, 5th Edition is designed to make algebra interesting and relevant to the student. The text adopts a problem-solving approach that motivates readers to grasp abstract ideas by solving real-world problems. The problems lie on a continuum from basic algebraic drills to open-ended, non-routine questions. The focus is shifted from learning a set of discrete mathematical rules to exploring how algebra is used in the social, physical, and life sciences. The goal of Explorations in College Algebra, 5th Edition is to prepare students for future advanced mathematics or other quantitatively based courses, while encouraging them to appreciate and use the power of algebra in answering questions about the world around us. Access to WileyPLUS sold separately. Dr. Linda Kime was formerly a professor at the University of Massachusetts-Boston. CHAPTER 1. AN INTRODUCTION TO DATA AND FUNCTIONS. 1.2 Describing Relationships between Two Variables. 1.3 An Introduction to Functions. 1.4 The Language of Functions. CHAPTER 2. RATES OF CHANGE AND LINEAR FUNCTIONS. 2.1 Average Rates of Change. 2.2 Change in the Average Rate of Change. 2.3 The Average Rate of Change Is a Slope. 2.4 Putting a Slant on Data. 2.5 Linear Functions: When Rates of Change Are Constant. 2.7 Constructing Graphs and Equations of Linear Functions. 2.9 Breaking the Line: Piecewise Linear Functions. 2.10 Constructing Linear Models of Data. 2.11 Looking for Links between Education and Earnings: A Case Study on Using Regression Lines. CHAPTER 3. WHEN LINES MEET: LINEAR SYSTEMS. 3.1 Interpreting Intersection Points: Linear and Nonlinear Systems. 3.2 Visualizing and Solving Linear Systems. 3.3 Reading between the Lines: Linear Inequalities. 3.4 Systems with Piecewise Linear Functions: Tax Plans. CHAPTER 4. THE LAWS OF EXPONENTS AND LOGARITHMS: MEASURING THE UNIVERSE. 4.1 The Numbers of Science: Measuring Time and Space. 4.3 Zero, Negative, and Fractional Exponents. CHAPTER 5. GROWTH AND DECAY: AN INTRODUCTION TO EXPONENTIAL FUNCTIONS. 5.3 Comparing Linear and Exponential Functions. 5.5 Exponential Functions: A Constant Percent Change. 5.6 More Examples of Exponential Growth and Decay. 5.7 Compound Interest and the Number e.
5.8 Semi-Log Plots of Exponential Functions. CHAPTER 6. LOGARITHMIC LINKS: LOGARITHMIC AND EXPONENTIAL FUNCTIONS. 6.1 Using Logarithms to Solve Exponential Equations. 6.2 Using Natural Logarithms to Solve Exponential Equations Base e.
6.3 Visualizing and Applying Logarithmic Functions. 6.4 Using Semi-Log Plots to Construct Exponential Models for Data. C H A P T E R 7. POWER FUNCTIONS. 7.1 The Tension between Surface Area and Volume. 7.2 Direct Proportionality: Power Functions with Positive Powers. 7.3 Visualizing Positive Integer Power Functions. 7.4 Comparing Power and Exponential Functions. 7.5 Inverse Proportionality: Power Functions with Negative Powers. 7.6 Visualizing Negative Integer Power Functions. 7.7 Using Logarithmic Scales to Find the Best Functional Model. CHAPTER 8. QUADRATICS AND THE MATHEMATICS OF MOTION. 8.1 An Introduction to Quadratic Functions: The Standard Form. 8.2 Visualizing Quadratics: The Vertex Form. 8.3 The Standard Form vs. the Vertex Form. 8.4 Finding the Horizontal Intercepts: The Factored Form. 8.5 The Average Rate of Change of a Quadratic Function. 8.6 The Mathematics of Motion. CHAPTER 9. NEW FUNCTIONS FROM OLD. 9.2 The Algebra of Functions. 9.3 Polynomials: The Sum of Power Functions. 9.4 Rational Functions: The Quotient of Polynomials. 9.5 Composition and Inverse Functions. 9.6 Exploring, Extending & Expanding. APPENDIX Student Data Tables for Exploration 2.1. Data Dictionary for FAM1000 Data. SOLUTIONS For all Algebra Aerobics and Check Your Understanding problems; for odd-numbered problems in the Exercises and Chapter Reviews. All solutions are grouped by chapter ANS-1. Explore & Extend: are a new feature in this edition. These "mini exploration" problems provide students with ideas for going deeper into topics or previewing new concepts. They can be found in every section. Accumulation of tools: The authors added a transformation to each chapter that covers functions. The intention of these changes is to progressively accumulate (about one per chapter) the tools for transforming functions. This is a way to discuss properties of functions using function notation and to use the transformations as new functions are introduced. Data: Data are updated throughout. Extended Explorations: The two Extended Explorations have been integrated into the text as sections in relevant chapters. Algebra developed from real-world applications: These materials are based on problems using actual data drawn from a wide variety of sources including: the U.S. Census, medical texts, the Educational Testing Services, the U.S. Olympic Committee, and the Center for Disease Control. Flexibility of use: The materials are designed for flexibility of use and offer multiple options for adapting them to a wide range of skill levels and departmental needs. The text is currently used in both small and large classes, two and four-year institutions, and taught with technology (graphing calculators and/or computers) or without. Many optional special features are described in following points. Many opportunities for students to practice: Each section includes Algebra Aerobics, which are intended to help the student practice the skills they just learned. At the end of each chapter the Check Your Understanding and Review Summary sections can help students review the major ideas of the chapter. Actively involved students: The text advocates the active engagement of students in class discussions and teamwork. The Something To Think About questions, open-ended exercises, and the Explorations are tools for stimulating student thought. The Explorations are an opportunity for students to work collaboratively or on their own to synthesize information from class lectures, the text, and the readings, and most importantly from their own discoveries. Emphasis on verbal and written communication: This text encourages students to verbalize their ideas in small group and class discussions. Suggestions for writing "60-second summaries" are included in the first chapter, and many of the assignments require students to describe their observations in writing. Throughout the text there references to wide a variety of essays, articles, and reports included either in the Anthology of Readings (in the appendix of the text) or on the book companion website at: www.wiley.com/college/kime. Many of the Explorations conclude with group presentations to the class. Technology integrated throughout: While the materials promote the use of technology and include many explorations and exercises using graphing calculators and computers, there are no specific technology requirements. Some schools use graphing calculators only, others use just computers, and some use a combination of both. This flexible approach allows Explorations in College Algebra, 4/e to meet the needs of many varying courses. Student Solutions: Step-by-step solutions to selected problems are provided at the end of the book.